The Lagoons of New Caledonia: Reef Diversity and Associated Ecosystems comprise a group of six lagoons that contain coral reef ecosystems with great species diversity and a high level of endemism. It is home to endangered dugongs and an important nesting site for the Green Sea Turtle. 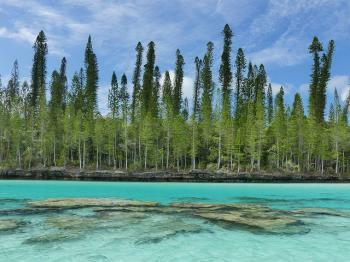 New Caledonia is an Endemic Bird Area with 23 species being found only in New Caledonia. I visited this WHS in December 2017. Of the 6 different locations which make up this WHS in the South Pacific archipelago and overseas French territory of New Caledonia, I visited 4 locations, namely the Zone Côtière Ouest and the Zone Côtière Nord-Est from the main island of Grand Terre, the Grand Lagon Sud from the main island of Grand Terre and from the Isle of Pines to the southeast and the Atoll d’Ouvéa et Beautemps-Beaupré from the island of Ouvea. In Noumea, on the Grand Terre, I rented a car to cover at least 3 locations out of the 4 which can be explored directly from the main island. The Grand Terre is 400km in length with mountain ranges and 5 peaks which are over 1500m, so driving from one place to the next requires a considerable amount of time but is quite easy especially from Noumea to La Foa or to Bourail. At each location I visited there were UNESCO inscription boards and maps depicting each of the 6 inscribed locations. The highlight on the Grand Terre were the crystal clear lagoons around the pretty mangrove islands which are inhabited by dugongs. Several action plans are in place to preserve these wonderful lagoons which are easily accessible by driving to the Plage de Ouano and following the Sentier des Trois Baies. From Noumea, taxis and public transport are not a reliable means of transport so factor this when visiting and allow enough time before departure even if most hotels will tell you not to worry. We were going to miss internal flights twice because taxis did not turn up! Another obvious highlight is the aerial view of the lagoons when landing/departing to/from Noumea and when flying to/from some of the smaller islands. The different hues of blues is second only to the Great Barrier Reef but the variety of colourful fish and sea life (dugongs, starfish, giant manta rays, different species of rays, sea kraits, seahorses, eels, sharks, whales, etc.) underwater is second to none. The absolute highlights of our trip to New Caledonia were the Piscine Naturelle at Oro and the coral rock islands of Baie d'Upi by pirogue outrigger from St Joseph Bay (the coral islands are quite similar to the rock islands of Aldabra, Seychelles or those of Palau but these are enclosed in a turquoise bay). They are both unique and spectacular places of the Grand Lagon Sud on the Isle of Pines where you can easily appreciate the OUV of this WHS and are worth the trip alone. We rented a small car in advance (worthwhile) on the Isle of Pines and every day we drove to the closest parking spot near Le Meridien hotel to hike/swim to the natural pool and Upi Bay. Apart from marine species, New Caledonia is quite famous for its 23 endemic bird species of which I proudly managed to spot 17 without any birdwatching guide. The highlights were the famous Cagou, the Grand Terre Horned Parakeet and the very rare Ouvea parakeet. Again on the atoll of Ouvea, I rented a car which proved to be a wise move in terms of mobility to spot birdlife but also to drive along the single loop possible on this small island. The highlight of the island were the drift passes for snorkelling but also the Trou à Tortues where we spotted 3 different species of sea turtles. All in all we spent around 10 days to cover these locations even though we spent most of our time in the Grand Lagon Sud area. The only touristy areas (still relatively small numbers) were the day trips to Duck Island or to the Amedie lighthouse. Other than that, New Caledonia really is a paradise island destination (which might become an island nation soon by referendum). Seeing the Lagoons and Reefs around New Caledonia involved viewing from the air, from vantage points on land, from the comfort of a cruising vessel and up close beneath the waves. The island of Ouvea in the Loyalty Group was best viewed from the air on the flight from Noumea. But once on the island the opportunity to use the pristine beaches as means of access to the shallow reefs was irresistable. 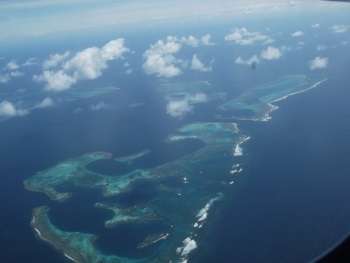 To reach the Isle of Pines I flew from Noumea across the southern reefs. 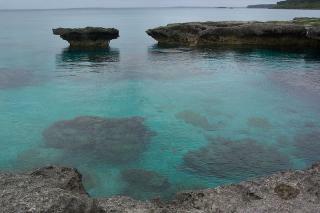 Once on the island I transferred to a cruiser and travelled around the reefs and offshore islands. The colours were spectacular. I drove up the West Coast of the Grand Ile stopping at Bourail to visit the coast in the vicinity of the 'Roche Percee'. After visiting more reefs around Kone I traversed the mountains to the opposite coast. I spent several days exploring the East Coast, a pristine coastal landscape extendimg from Pouebo south to Poindimie. Every bay and estuary provided a different vista. Time prevented me from reaching the Grand Northern Lagoon and the atolls of Entrecasteaux. Holocene: Process of reef formation started in the Pleistocene, lagoons of today became water-filled during the Holocene. 22 Community Members have visited.